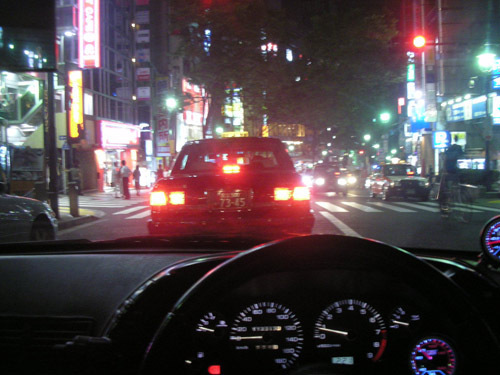 I used to live in Tokyo in a small section called Kokubunji. I stayed there for my entire first year living here too. 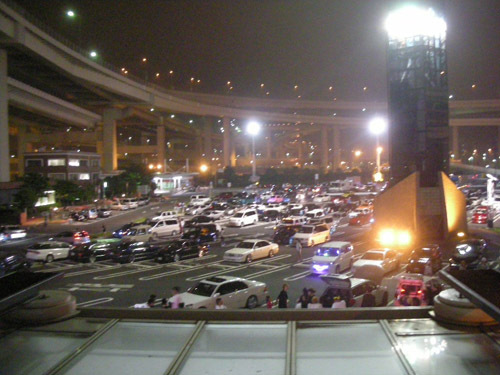 The problem with that place was, while it was officially in Tokyo, it was still over an hour by train to my university. 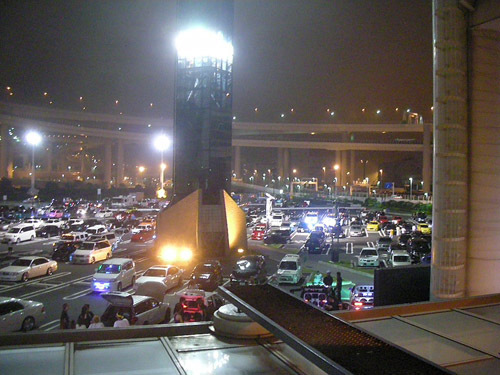 For that reason, I moved to Yokohama, the second biggest city in Japan. I've been here for about a year and I gotta say, this place is nice. That's not what today's post is about though, we'll do that another day. 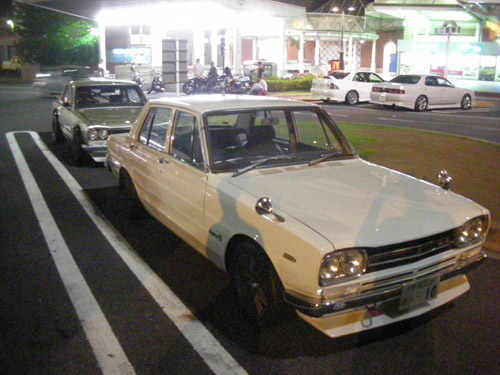 What I wanted to talk about was the close proximity of my new apartment and Daikoku-futo. 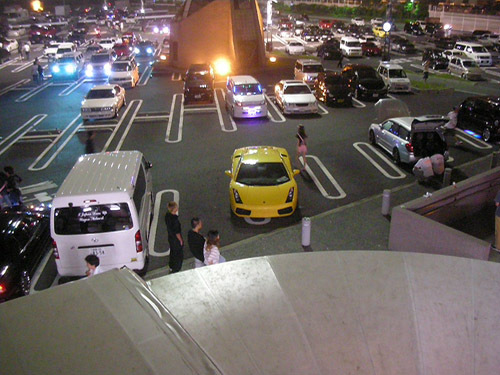 If you recall from an earlier post or maybe from other websites or videos, Daikoku is a huge parking area in the middle of a man-made island on the ocean. 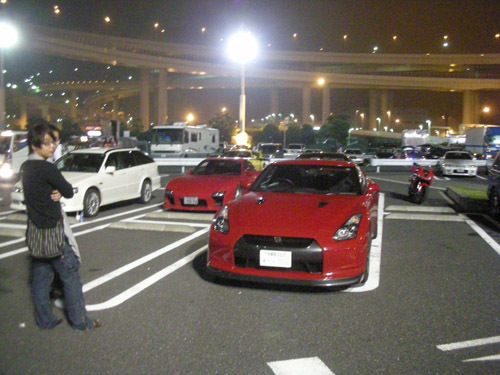 It's famous for car meets and even has an area utilized by drifters for some street drifting action. It just so happens by luck that my new house is about a mile or two away from it. Because of this, I get a chance to go stop by Daikoku almost every weekend. Before, it took me $15 in tolls and an 45 minutes to drive to Daikoku, now only 6 minutes and $6. I rustled through my cameras old pics and found some archives of the first expedition to Daikoku after moving. I took my friend Mark (who you might've seen on youtube as MarkFrankJPN) and headed out. Right of the bat I knew this was going to be a good night. 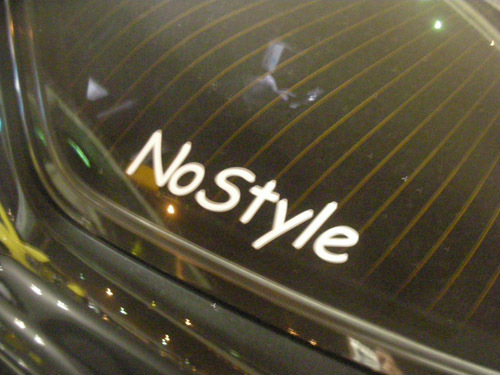 This FC belongs to a car club called "No style". I wonder if they fully understand the meaning of the term? 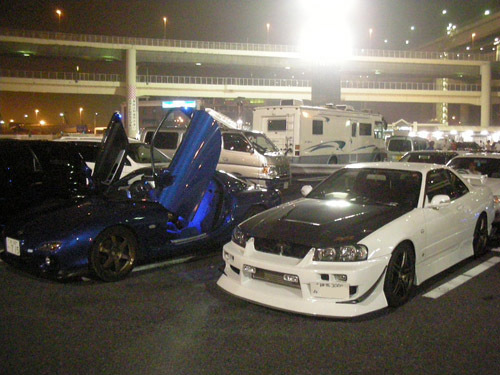 I parked my R32 next to the FC. 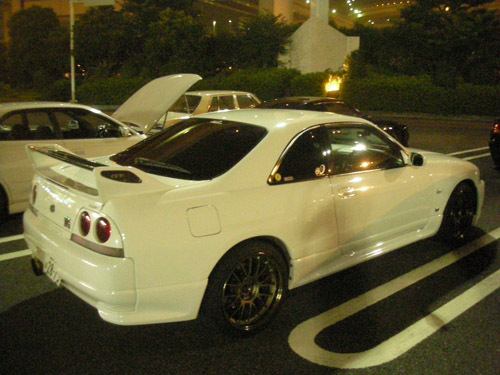 You can see my R32's fresh new face (I happened to remove the prior face by sliding it into a guardrail on the touge in Hakone awhile back). These guys are actually here pretty often. Fully done up exteriors and I'm assuming some engine work as well. The S15 has "NOB" written on the window, could it be the famed D1 driver's personal car? 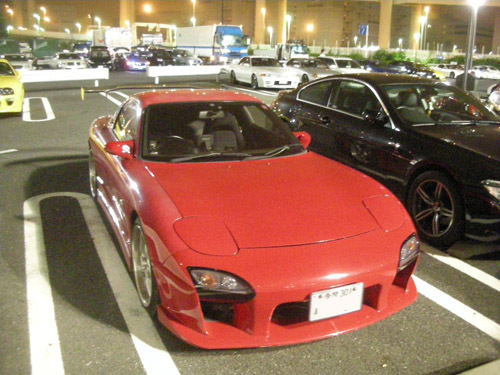 Anyway, that FD's full RE Amemiya aero kit made me pretty happy. I later looked it up on their site, that kit doesn't come cheap! I like the new GTR. Enough said. 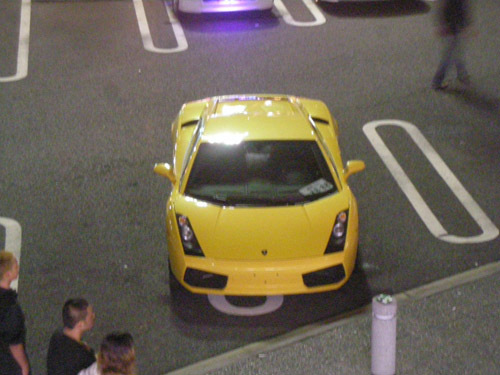 Man FDs...it was my first dream car. Their body lines are so amazing. 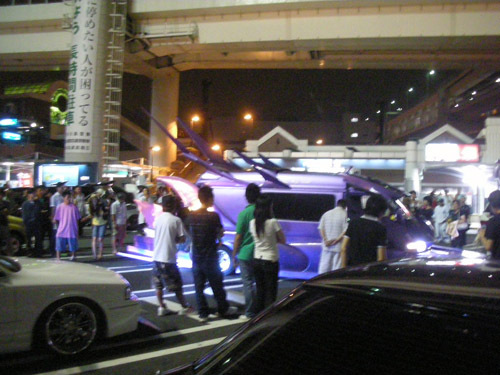 Apparently everyone in Japan with cars are super rich though cause this guy is sporting RE Amemiya aero as well. Ohhh man don't let me get started about this guy. 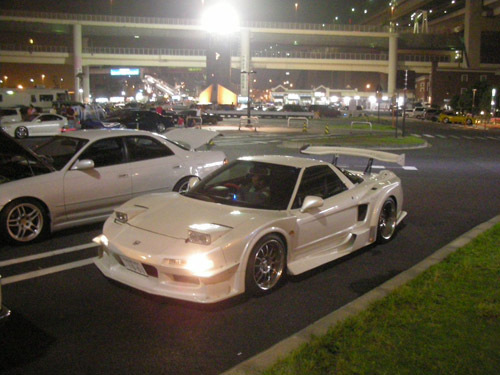 Sometimes you'll run across some small k-car with way too many strobing neons but this guy was on a whole other level. Instead of describing him to you in detail, just watch Mark's video. Look at the front. What the hell? Is he serious? The interior has a Batman Returns theme too, nooo idea why. How much did this cost? This thing is insane!! 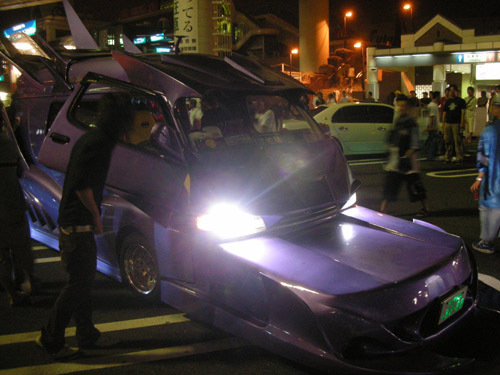 Ok back to some normal cars. This Soarer is nice and clean. 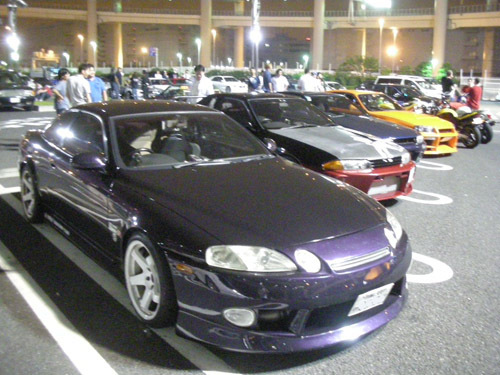 I know that when the D1 Driver Ueno started sporting the Soarer it spurred a huge popularity increase in the states, but I wonder if it was always a popular tuning platform in Japan. I just can't stop taking pictures of GT-Rs. Damnit! 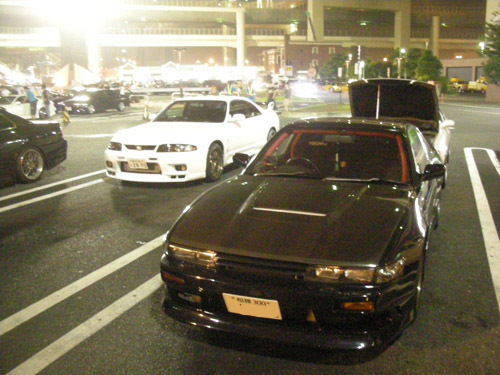 It's actually kinda uncommon to see drift cars come to Daikoku PA. 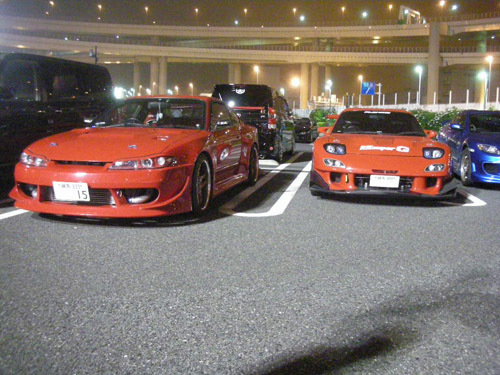 The drift spot at Daikoku is separated completely and while they may be within feet of each other, to access the other requires quite the long drive. You must come in by surface streets to the drift spot while the PA is connected within the highway system. Regardless, I like this S13. The front end is clean too. 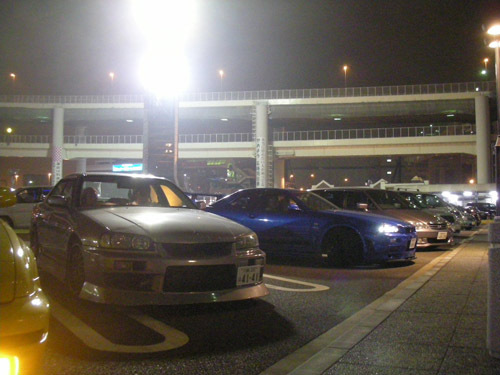 The Halogen headlights fit the lines of the S13 far better then the projectors in my opinion. 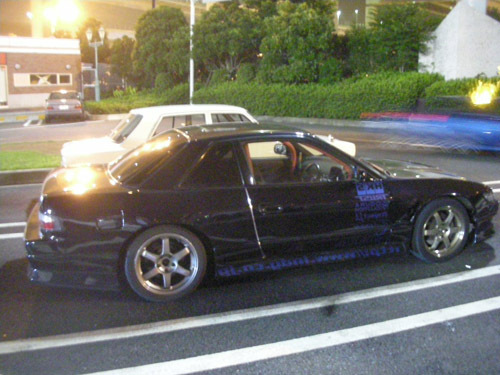 Car also has a nice carbon hood and a roll cage, looks like he means business. Oh my favorite! Two Hakosukas out for a stroll. Hearing them in person is quite unbelievable. 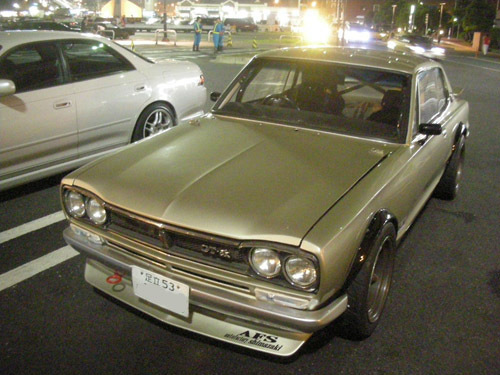 I can only imagine what it must've been like to hear it in the 70's when all the other normal Japanese cars sounded so boring. 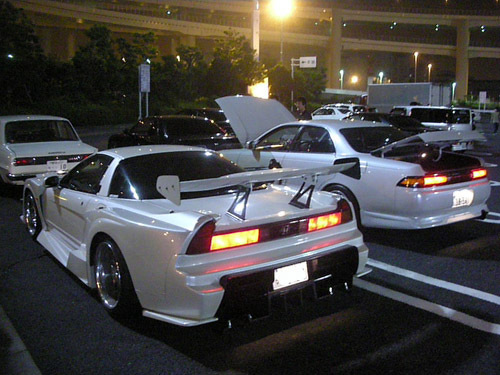 I almost NEVER see NSXs come out, especially completely aero-ed up ones. This reminds me of the exact same one out of Tokyo Extreme Racer that I played in High School. It's nice to say the least. It's a shame they're so super expensive. 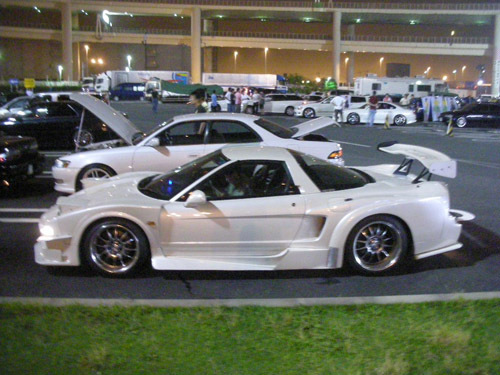 I've been putting some thought into selling my R32 and getting a Mark2 like the one parked next to this NSX. What do you think? What the hell happened to that FD's doors? No, that's not right. R34 is right though. 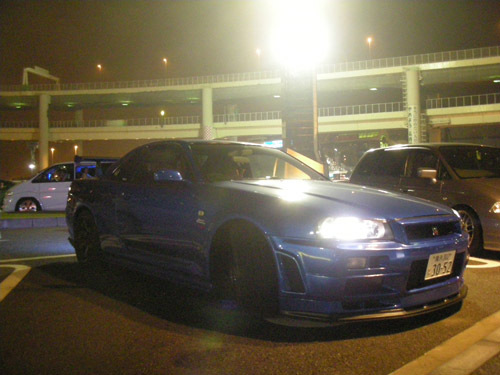 More R34s are more right. BAM! Right in your face. I wish I lived in an alternate universe where Nissan offered this car to the US market. 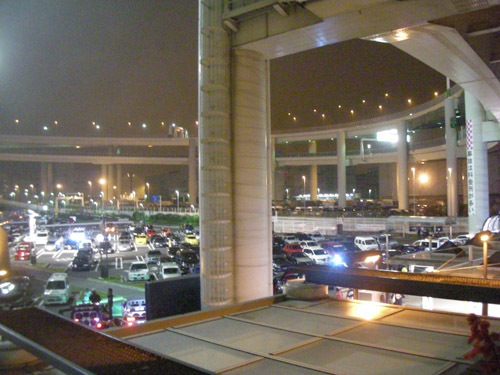 It's quite an expansive parking area with highways winding around the center. I've never seen anything like this in California, crazy. How much money do these people have!? Well that's enough of Daikoku. 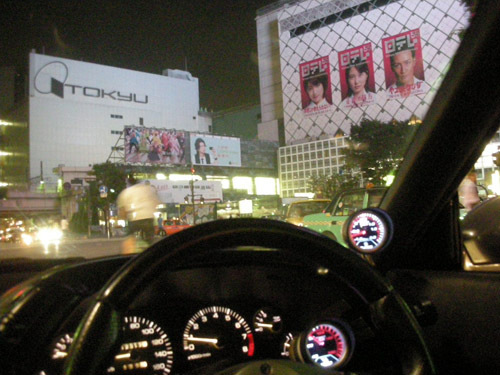 Just for kicks Mark and I thought it'd be fun to get off the highway and drive around Shibuya. I've walked the area a thousand times but never experienced the insane traffic for myself. That's the Shibuya station entrance in the distance. 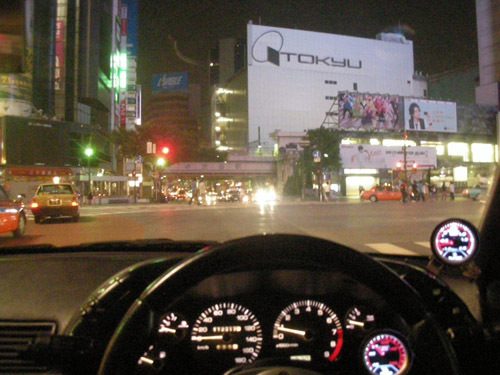 This intersection is the same intersection where the characters "drifted" in Fast and the Furious: Tokyo Drift. It's not nearly as exciting in person as it seemed in the movie. 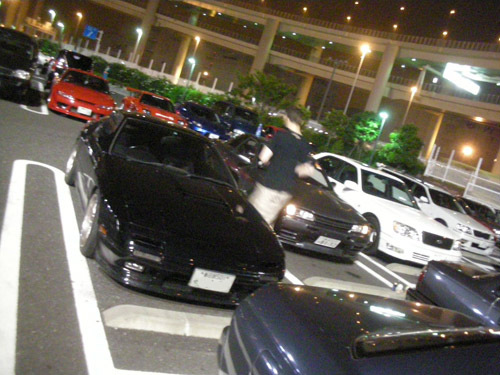 Then again I wasn't drifting through a crowd of people while angry Japanese people chased me with guns. 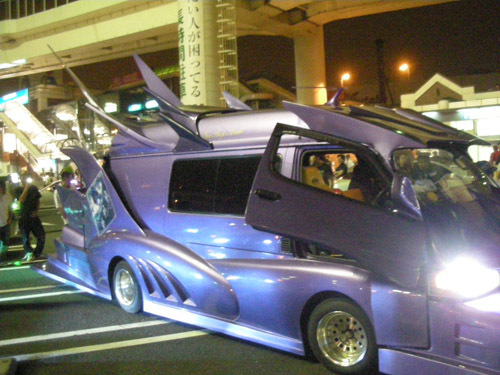 Anyway, now that I live so close to Daikoku, I'll be sure to share more of the cool and strange cars that come out. Thanks for reading!